The great Israeli American psychologist and Nobel Laureate in Economics, Daniel Kahnemann (in the company of his late redoubtable colleague Amos Tversky), has been the torch bearer and very beacon in pioneering the efforts to both understand and challenge the assumptions of human rationality. Mr. Duffy also treads the same path of empiricism in highlighting to his readers the perils of perception that characterizes the various assumptions, which, otherwise are perceived to be accepted wisdom or common place conventions. What is the underlying rationale behind such irrational thinking? Mr. Duffy elucidates that all varied explanations of our misperceptions can be classified into two groups: how we think and what we are told. Mr. Duffy talks about ‘emotional innumeracy’, “a theory which proposes that when we are wrong about a social reality, cause and effect may well run in both directions. For example, say that people over estimate the level of crime in their country. Do they over estimate crime because they are concerned about it, or are they concerned about it because they over estimate it?” In this particular case, Mr. Duffy proposes that it is a bit of both. Mr. Duffy also presents a vital link between our misperceptions and the media. “It (media) is still a vital actor in the system creating and reinforcing misperceptions. However, the media more generally is not actually the most important root cause of our misperceptions, though it is influential: we get the media we deserve or demand.” It is not hard to fathom this logic especially in times where a referendum to either Remain or Leave the European Union is influenced by preposterous claims pasted boldly on the sides of buses, and where a dangerous clarion call of ‘nativism’ results in the election of a virtual demagogue to the highest office of the world’s oldest and powerful democracy. Not to mention a word about the dangerous dalliance between Facebook and Cambridge Analytica that had in the eye of its storm, the minds, decisions and future of 87 million human beings. The book makes for a stirring and thought provoking read. We are made to get a contrasting glimpse of enthusiastic radical optimists and somber prophets of doom as they go about breathing life into myriad surveys. The moral arc of the respondents to the survey seemed to seek their curve depending upon the nature of information fed to them. For instance, the relationship between public concern about immigration, net migration and media coverage of the issue presented an interesting tendency: immigration numbers rise before the media and then the public notice. Also attitudes to immigration were starkly different depending on the respondents’ preferred choice of media. Ronald Harry Coase the late a British economist and the Clifton R. Musser Professor Emeritus of Economics at the University of Chicago Law School and also the recipient of the Nobel Prize in Economics in 1991, once famously exclaimed, “If you torture the data long enough, it will confess.” Mr. Duffy in his highly engaging book, not only concurs with Coase but also produces his own proofs. After treating the foible of misperception in great detail and depth, Mr. Duffy, then proceeds to provide a ‘checklist’ for managing our misperceptions. Exhorting us to “cultivate skepticism, but not cynicism”, goading us to “accept the emotion, but challenge the thought”, Mr. Duffy exudes confidence in the fact that “things are not as bad as we think – and most things are getting better.” It is with this very positive exultation that I nurse my only reservation with what otherwise is a marvelous piece of work. Mr. Duffy with his ‘Pinkeresque’ conviction about the world being a better place to live now as compared with the past, might be misconstrued as urging his readers to view the Planet that we inhabit with rose tinted glasses. Even though one of the items in his ‘managing misperception’ checklist is ‘fact checking’, an unsuspecting reader might be forgiven in harbouring the impression that his erudite author is not averse to producing a paean to Pollyanna. One classic example being the subject of poverty. Mr. Duffy expostulates that “just one in ten correctly identified that extreme poverty has halved in the last 20 years.” While there is no disputing the fact that world now is definitely a more positive and healthy place than what it was two decades ago, the measure of ‘extreme poverty’ and its definitions may be subject to a myriad of interpretations and a plethora of contrasts. This shenanigans of Statistics may have the undesirable outcome of flattering to deceive. As Thomas Pogge poignantly pointed out, “the morally relevant comparison of existing poverty is not with historical benchmarks, but with present possibilities: How much of this poverty is really unavoidable today? By this standard our generation is doing worse than any in human history.” Also as Jason Hickel, painstakingly and adroitly shows in his phenomenal treatise “The Divide”, “the present International Poverty Line (“IPL”) theoretically reflects what $1.25 could buy in the United States in 2005. But the US Government itself calculated that in 2005, the average person needed at least $4.48 per day simply to meet minimum nutritional requirements, and that is to say nothing of housing and other costs necessary for basic survival.” This and the preceding paragraphs are by no means either illustrative of a negative opinion or a criticism of Mr. Duffy’s work. It is just an instructive attempt to show that the tool of statistics can, – in fact is – a double edged sword. 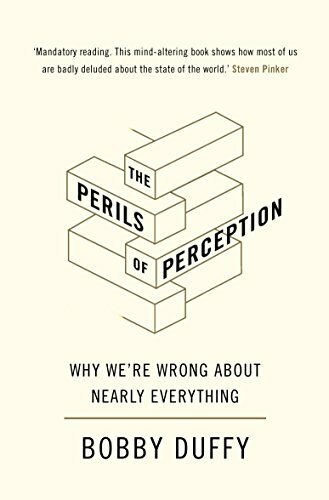 “The Perils of Perception” by Mr. Duffy is an invigorating, timely and essential read. This is a book that needs to be not just read, but absorbed and assimilated, more so in a world where ‘truthism’ competes with ‘fake news’ for attention and ‘post-truths’ and propaganda walk in lockstep. By the way, The Great Wall of China is NOT visible from outer space. For all you skeptics, since the legendary Neil Armstrong is no longer amidst us to prove this fact, the next best clarifying port of call would be Mr. Bobby Duffy. Over to you Mr. Duffy! Her world was a splash of riotous colours. An intricate abode of yarns, spindles and bobbins. The staccato burst from the sewing machine that accompanied a fast yet methodical movement of arms and legs was her way of embellishing an unsung melody. What began as an exciting calling had now transcended into a very affirmation of her soul. Today was no different than what was yesterday and what would be tomorrow. Helen lived her present which was moulded by the past and made malleable to the future. Arranging her multicoloured yarn and threads in tidy boxes, she perched herself on her chair facing a table upon which sat her trusted sewing machine. Order was a perfect necessity for the desired outcomes. With great precision Helen wound the thread on the spindle. Working with a dexterity that was ridiculously perfect, she began to stitch the first scarf of the morning. It was not always like this. Even now she involuntarily shuddered when she remembered the stumbles and slips when she first lost her vision. Thank You Yarnspinnerr for the photograph!